Item description: On 4 July 1861, the Thirty-seventh United States Congress met in special session to decide whether or not to approve President Abraham Lincoln’s request for additional soldiers and money to prosecute the war. In a now famous address (dated and sent to Congress on 4 July 1861, but read in session on 5 July 1861), Lincoln outlined the events that ignited the war, described his view of the fundamental purpose of government, and presented his rationale for the conflict in defense of the Union. 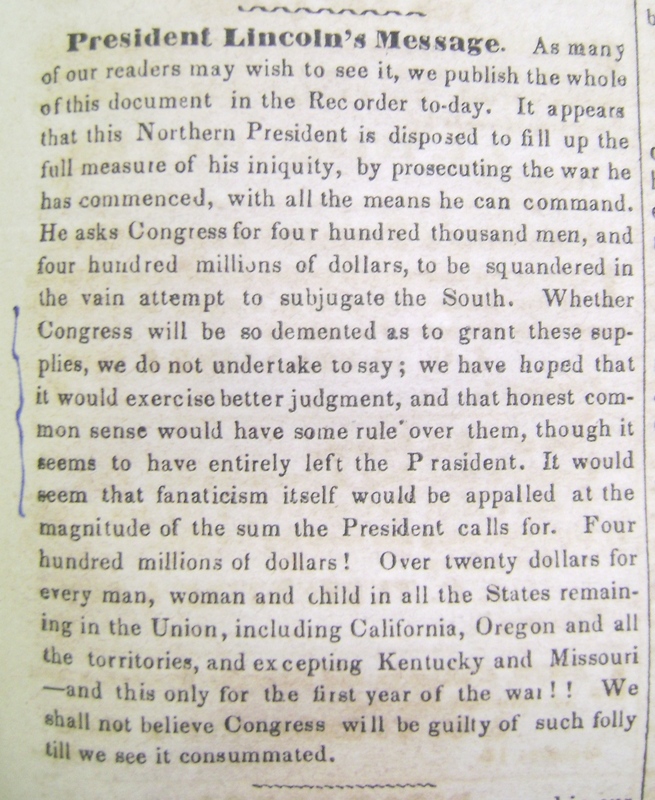 Over the days that followed Lincoln’s address to Congress, Southern newspapers ran the full text of Lincoln’s lengthy speech and published scathing editorials about the President’s call for troop mobilization and special war-time funding. 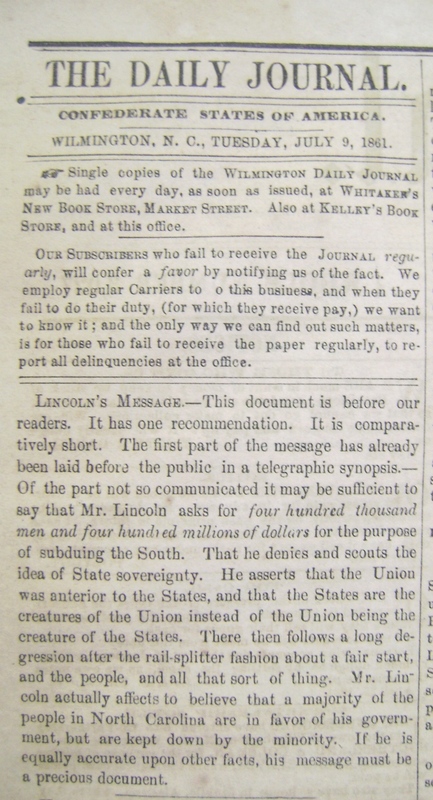 We include below various selections of the editorial response to Lincoln’s address, as published in North Carolina newspapers. 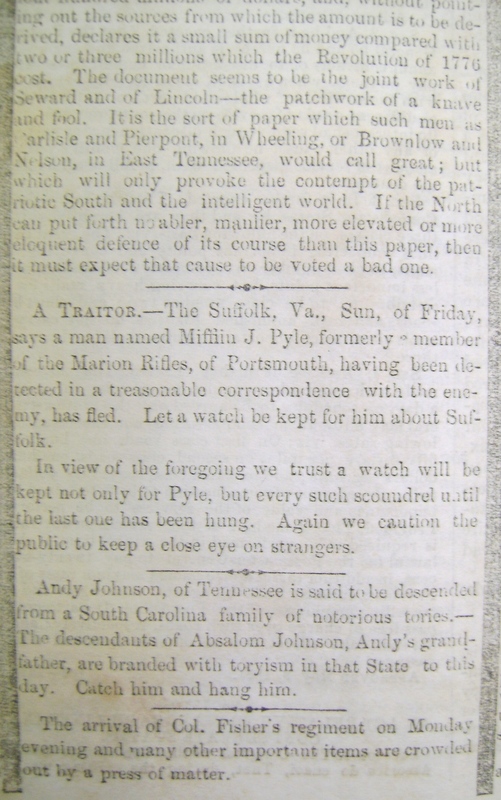 From the 9 July 1861 issue of the Daily Journal (Wilmington, N.C.), North Carolina Collection, The Wilson Library, University of North Carolina at Chapel Hill. 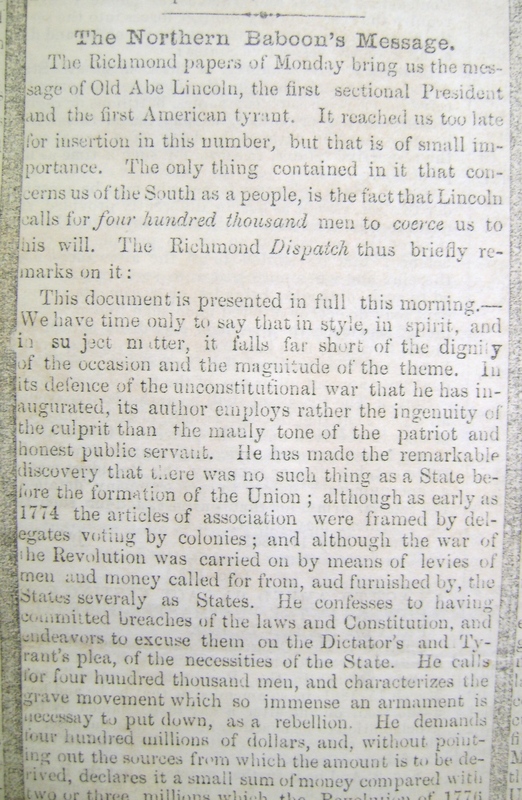 This entry was posted in North Carolina Collection and tagged Abraham Lincoln, editorials, July 4th, newspapers, speeches, The Daily Journal, The Hillsborough Recorder, The State Journal, United States Congress. Bookmark the permalink.